Well now that Verizon has stopped digging up my front yard and my cable modem is back online I can post this. This past weekend was the Chantilly, VA woodworking show. I was able to get some time on Friday and Saturday to head out there. On Friday I met up with Karson and Greg as noted here in Karon's Blog. On Saturday I again met up with Greg as well as his brother Adrian and their families. I was happy to meet everyone. Thanks for all the input on various tools and also some great ideas. 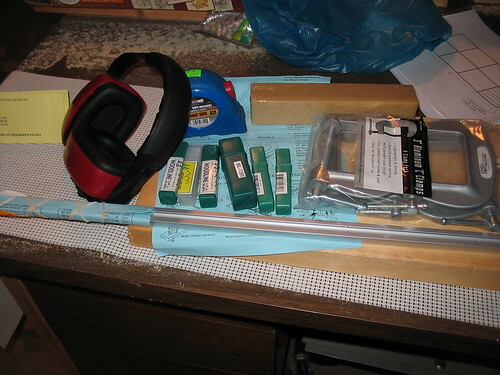 I did not have a lot of money to spend but did manage to get a few smaller things for my shop. As noted below in the pictures . 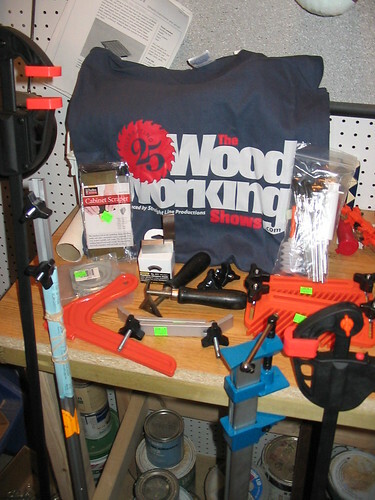 The tshirt was a freebie to celebrate 100 25 years of the Woodworking Show. Those scrapers work pretty good some one was sell them in a used tool bay, supposedly WWII surplus. I hope to be able to learn to use them and that scraper set there. We’ll see how the clamps work out, I bought some last year and they were great, this year they only had 36” and 48” but at $5 a piece I decided to add them to my growing arsenal. Finally got myself a set of headphones, man they make that router sound different. :). Hopefully I will be posting a drill press table in the not to distant future which is where most of that mini-T-track is going. Most of my money that day went towards all of those new router bits you see in the boxes, I have been playing with making signs per a request I got from my father-in-law, so needed a few decent bits. Company called Got Logs. actually sells boards that are priced as marked not per bd ft. A lot of them may have some issues to work around and I wish I had bought some that I saw earlier in the day. 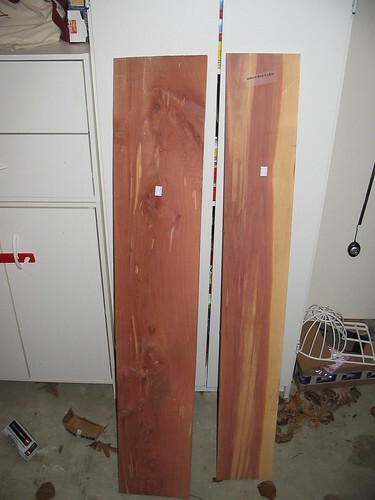 But I got these two pieces of Eastern Red Cedar for only $9, I have a project already in mind and my theory was for the price I really can not go wrong. 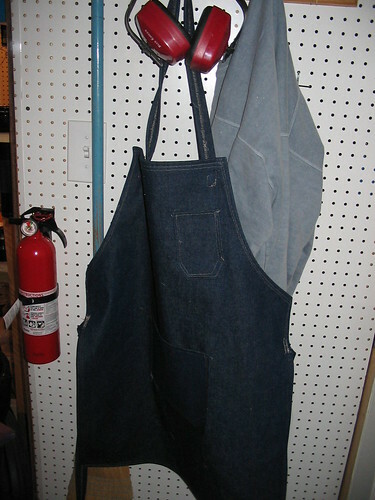 And lastly my wife was able to finish up one of her projects this past weekend as well and I now have a shop apron to help keep some of the sawdust off of me. cool. i’ve got to find a woodworking show that i can go to. they sound like they have a lot of great things. Looks like you spent a good chunk of change. Good job. The Woodworking show in Kansas City took me for a pretty big chunk of change. Lots of fun though aren’t they. At time I wish they were every weekend, but then I feel the hole where my wallet was and am thankful they are once a year and I can make an event out of it. Eventually I’ll get around to making my drill press table too, I got some of the T-Track while there for the same purpose. You can’t take it with you. You have some nice buys there. Sounds like you had a “Christmas type” weekend. Plenty of new toys, seeing and meeting new families, and looking at a lot of woodworking stuff – don’t get much better than that. Wow…you got more than I realized. Great haul. Just getting my stuff set up, I’ll be posting a blog on it soon. My family and I had a wonderful time and I was really glad that we got to meet. It was a real treat meeting another jock in person (hopefully not my last). -- Adrian ..... The 11th Commandment...."Thou Shalt Not Buy A Wobble Dado"
Greg, Adrian, Karson I am glad we got to catch up and hope to some other time as well, keep me in the loop on any picnic ideas that come up. Greg looking forward to seeing the new set up posted.